Love paranormal? Historical? Romance? You’ll eat Susanna Kearsley’s The Firebird up, with a spoon. Here’s the premise: Art historian Nicola Marter has many skills. She has a degree in History of Art, and another in Russian Studies – a perfect fit for Galerie St. Croix, which specializes in Russian art and artifacts. A skill that she doesn’t advertise: she’s psychic. All she has to do is touch something to see its history. But she’s ambivalent at best. This ability runs in her family, and her grandfather has made it clear that keeping her head down is a must. She tried to explore it while in college, even enrolling in a study to test and authenticate her gift, but was too stressed and dropped out. But when a woman comes to the gallery with a family heirloom – a small carving she says was given by the Russian Tsar Peter to his wife, the Empress Catherine – Nicola knows in an instant that it is authentic. But how to prove it? Only a psychic journey through history will provide the clues necessary to trace a link from today’s owner to the original owner. So Nicola turns to the best psychic she knows: police officer and fellow study-enrollee, Rob McMorran. Unlike Nicola, Rob embraces his abilities, and under his tutelage, she learns to harness hers. There are two parallel stories in The Firebird: Nicola and Rob in the present day, and Anna Moray, who grows from small girl to lovely young woman over the course of the novel. Anna is fortunate, because although she is often endangered, there are many who love her – including the dashing navy officer, Edmund O’Connor. That both couples find happiness, and the firebird’s heiress a fortune, should be no surprise. For those who on historical accuracy, it appears that Kearsley’s done her homework, as her afternote attests. For those who are not so historically inclined, it’s a good tale, well-told. 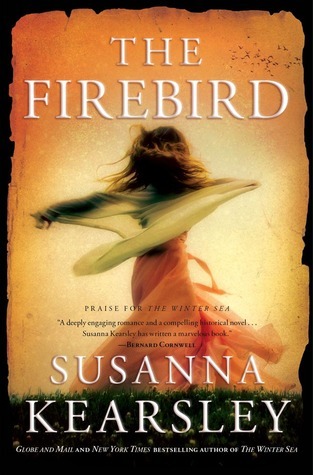 This entry was posted in Commentary, Review and tagged historical novel, paranormal, Review, romance, Susanna Kearsley, The Firebird. Bookmark the permalink.